ProFold™-ER1 baculovirus genomic vector DNA encodes major human molecular chaperones Calreticulin and protein disulfide isomerase (PDI) that facilitate folding of target proteins in the endoplasmic reticulum (rationale). Genes encoding these molecular chaperones are inserted into baculovirus genome far away from the polyhedrin site to avoid interference of strong promoters controlling their expression (Fig. 1). The polyhedrin site is reserved for insertion of target genes under control of strong polyhedrin promoter. Initially, the polyhedrin site was occupied by E.coli β-galactosidase gene. To allow insertion of a target gene, β-galactosidase gene was removed from the baculovirus DNA using Bsu36.I restriction endonuclease which cleaves immediately downstream of the polyhedrin promoter, in the β-galactosidase gene and in the downstream essential gene ORF 1629. In addition to the chaperone genes, ProFold™-ER1 encodes Aequorea victoria green-fluorescent protein (GFP). Expression of GFP allows for convenient monitoring of recombinant baculovirus infection. GFP, PDI and Calreticulin are expressed very late in infection, at about the same time as the target protein. Fig. 1. Schematic representation of ProFold™-ER1 DNA. Genes encoding Calreticulin, GFP and PDI are designated by arrows. Corresponding promoters are not shown. Polyhedrin promoter is designated by the black triangle. E.coli β-galactosidase gene is originally present in the polyhedrin site. However, in commercially available ProFold™-ER1 vector it is removed alongside with a part of an essential gene to allow substitution of β-galactosidase gene for a gene of interest (target gene), refer to TECHNOLOGY for more details. ProFold™-ER1 can drive the rate of the target protein synthesis that is close to the maximum achievable in a recombinant baculovirus system for a concrete target protein, while the level of synthesis of molecular chaperones is elevated to the level comparable with the synthesis of a well expressed target protein, but not in a way that would compromise the target protein synthesis rate (Fig. 2). E.coli β-galactosidase (β-gal) was expressed as a target protein in the polyhedrin site for to allow adequate comparison of the rate of the target protein synthesis between chaperone vector Profold™-ER1 and conventional vector BacPAK6™ as its folding is not chaperone-dependent. As shown on Fig. 2, target protein (β-gal) is expressed by both vectors to about the same high level, while ProFold™-ER1 is also expressing molecular chaperones PDI and Calreticulin to comparable levels. Simultaneous high level expression of four recombinant proteins (target protein, PDI, Calreticulin and GFP) rather than one, as compared to any other commercially available vector, is achieved by separating genes encoding these proteins far away from each other on the baculovirus genome to avoid interference of strong promoters that control their expression. Fig. 2. 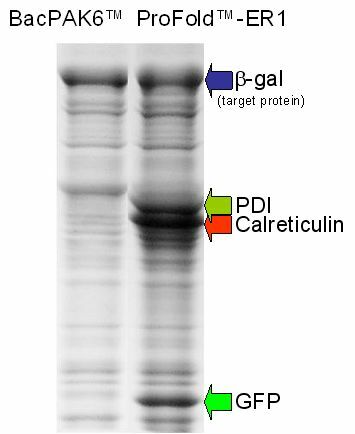 Protein expression profiles of insect cells infected with BacPAK6™ and ProFold™-ER1 –based recombinant baculoviruses that are expressing E.coli β-galactosidase (β-gal) in the polyhedrin site under control of polyhedrin promoter. β-galactosidase was chosen as a target protein for comparison of the general rate of the protein expression in the polyhedrin site between these vectors as its folding and yield is not chaperone-dependent. Spodoptera frigiperda Sf9 cells were infected with recombinant baculoviruses at multiplicity 5 plaque forming units per cell and harvested at 60 h post infection. Cells were lysed in 50 mM Tris-HCl pH 8.0, 150 mM EDTA, 0.5% NP-40 and the lysate was centrifuged at 30,000g for 15 min. β-galactosidase, PDI, Calreticulin and GFP are highly soluble and are found almost exclusively in the supernatant. The supernatant proteins were separated in 11% SDS-PAGE and stained with Coomassie blue. Recommended plasmid transfer vectors. As shown on Fig. 3 below, a large selection of plasmids is compatible with ProFold™-ER1 vector to suite various protein expression and purification requirements. We offer vectors that can provide a highly efficient signal sequence (pAB-bee™, pAB-bee™-8xHis, pAB-bee-FH™ plasmid transfer vectors) to facilitate expression of secreted and membrane proteins. A target protein can be expressed with either GST, His, GFP, MBP or dual His/ MBP, or FLAG/His tag or expressed without a tag using the pVL1393 plasmid vector. However, it has to be noted that adding N-terminal tags to the target proteins that start from N-terminal signal sequence is not recommended as this is likely to disrupt their translocation into the ER. Such proteins can be either provided with C-terminal tags or with an N-terminal 8xHis tag that follows strong signal sequence encoded in pAB-bee™-8xHis vector. Up to 3 target proteins can be expressed using pAcAB3 vector that is also compatible with ProFold™-C1 and -C2 vectors. Fig. 3. 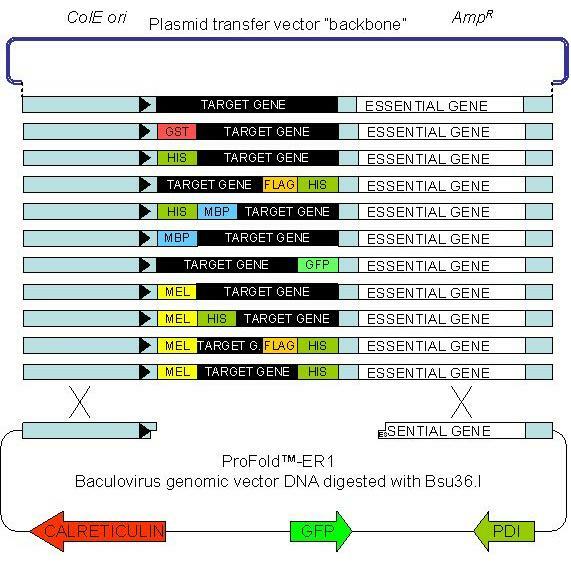 Schematic representation of plasmid transfer vectors compatible with Profold™-ER1 baculovirus vector DNA. All plasmid transfer vectors have the same plasmid “backbone” that allows plasmid propagation in E.coli (designated by blue double line), but they differ in the part downstream of the polyhedrin promoter (designated by black triangle). Refer to TECHNOLOGY for conceptual details. Click on the plasmid name for detailed information on each plasmid. Click on the Cat# for pricing and ordering. Table 1. Plasmid transfer vectors from other suppliers compatible with ProFold™-ER1. Rationale. About a quarter of all human proteins are translocated into the ER. Polypeptide chains are transferred from the cytoplasm across the ER membrane through a pore in a protein translocator. When unfolded polypeptide chain emerges from the pore into the lumen of the ER, it interacts with molecular chaperones that prevent emerging chain aggregation and facilitate its folding. Though insect cells synthesize ER molecular chaperones at the levels which are adequate for insect cell functions, these levels are often insufficient to facilitate folding of target proteins which are synthesized to a much higher level. Misfolded target proteins either accumulate as inclusion bodies or degraded via ER-associated degradation (ERAD) pathway (Vembar and Brodsky, Nat Rev Mol Cell Biol., 9: 944-57, 2008). To facilitate folding of overexpressed target proteins, we inserted genes encoding human Calreticulin (Acc# AAH20493) and PDI (Acc# CAA28775) into baculovirus vector DNA which drives expression of these chaperones to a high level, compatible with the level of synthesis of an overexpressed target protein (Fig. 2). Both PDI and Calreticulin assist protein folding in the ER (Williams, J. Cell Science, 119: 615-623, 2005; Appenzeller-Herzog and Ellgaard, Biochim Biophys Acta., 1783: 535-48, 2008). Calreticulin and closely related Calnexin are lectin chaperones that interact with folding glycoproteins bearing monoglycosylated oligosaccharides. They can also directly bind polypeptide chains and facilitate folding of non-glycosylated proteins in the ER. In the baculovirus system, chaperone-assisted folding involving either of these chaperones was demonstrated to be efficient in improving production of biologically active secreted and transmembrane target proteins (Chang et al., J Biol Chem., 272(46): 28925-32, 1997; Tate et al., J Biol Chem., 274: 17551-8, 1999; Higgins et al., Biochim Biophys Acta., 1610: 124-32, 2003; Fourneau et al., J Immunol Methods., 285: 253-64, 2004; Culina et al., J Biol Chem., 279: 54210-5, 2004). For example, co-expression of human Calreticulin with lipoprotein lipase in insect cells resulted in a 9-fold increase in its enzymatic activity (Zhang L. et al., J. Biol. Chem., 278: 29344-51, 2003). Proteins that are translocated into the ER often contain multiple cysteine residues linked by disulfide bonds. PDI is a major chaperone participating in the formation of disulfide bonds. PDIs have multiple functions and, though most abundant in the ER, they are ubiquitous (Turano, C., et al., J. Cell. Physiol., 193: 154-163, 2002). Initially, PDI was demonstrated to be efficient in oxidative protein folding in vitro (Weissman and Kim, Nature, 365: 185-188, 1993). Subsequently, overexpression of PDI was reported to improve yields of soluble or secreted protein in yeast and insect expression systems (Robinson A.S. et al., Bio/Technology, 12: 381-384, 1994; Schultz L. et al., Ann. NY Acad. Sci., 721: 148-157, 1994; Shusta, E.V., et al., Nature Biotechnology, 16: 773-777, 1998; Hsu T.A. et al., Protein Expr. Purif., 7: 281-288, 1996; Wang L., et al., J. Biol. Chem., 272: 27644-27651, 1997; Vad et al., J Biotechnol., 116: 251-60, 2005; Xu et al., Metab Eng., 7: 269-79, 2005; Inan et al., Biotechnol Bioeng., 93: 771-8, 2006). PDI can also facilitate folding of target proteins independently of the disulfide bonds formation. For example, secretion of parathyroid hormone that does not contain any cysteine residues was significantly improved in yeast system by co-expression with PDI (Vad et al., J Biotechnol., 116: 251-60, 2005). A welcome, albeit unexplained effect of PDI in insect cells infected with recombinant baculoviruses, is that PDI improves longevity of such cells. This cytopathic effect is markedly less pronounced in infected cells expressing a high level of PDI, and such cells survive about 24 hours longer than cells infected with a control virus which does not provide for PDI expression. Similarly, PDI overexpression in mammalian cells resulted in increased longevity and time of recombinant protein production (Kitchin and Flickinger, Biotechnol. Progr., 11: 565-574, 1995).